This week on Goodreads.com, Superstition Review‘s Poetry Editor, Abner Porzio, reviewed two of his latest reads. Or Consequence, by Cynthia Hogue. 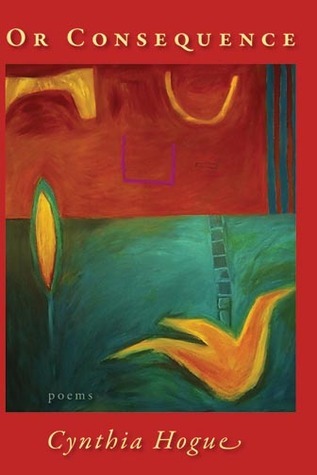 Of utmost brilliance, Hogue’s collection of poems compels readers to journey forth and contemplate histories, causation, and unanswerable questions. Life’s grounding complexities and the boundaries of conscience are sewn together by the delicate and strong mindful poet. 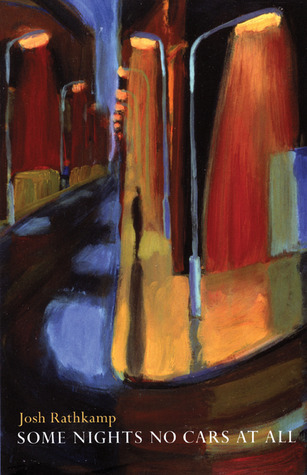 The mastery over focal points, techniques of blurring and redefining panoramas of place and time, string both universal and modern truths to the humanity that has been reconnected or what has been left naturally incomplete. Tragedies are shown as temporal, and yet, they are devastating events to be acknowledged collectively as part of the human experience. Pain is the human denominator. Suffering gets transmuted through hearable voices. Governing dynamics test the limits of the spirit when unanswerable histories and body experiences are questioned for their causation. Struggle for understanding exists in being stuck contemplating in-between past and present, causes and effects. The poetry asks readers to be reminded of the constraint of the ‘element being’ grounded in a body. Hogue’s poems have exquisite profound gifts of sounds, which add elegant depths of resonance. Hogue’s sensitivity to how semantics and pragmatics choose the idiosyncratic communications simply honors natural languages as persistent and being capable of uncovering the inexistent. The acute articulation of linguistic expressions ranges beyond the comprised syntax with powerful erasures and silencing strikethroughs. Genius at metaphor, actions are of most significance. Some Nights No Cars at All, by Josh Rathkamp. An immediate must read. Rathkamp’s collection of poems travel the mind inward to the perplex phenomenon of the familiar place, while travelling alongside each of the speakers’ trusty precise observances. These locations are where mere destinations only get furthered for the better; for they allow readers to arrive at their own active insightfulness and rediscoveries. Over and over again, his invaluable poetics carry each read to real heights of ambivalence. Truths, majestic assumptions, and understandings of what it means to be human are of interest. Physical and emotional manifestations of human imperfections have literal transparencies. The absence, loss, and the theme of emptiness countered the implications of the refilling notions of transient place. Rathkamp’s verses are saturated with specific visual details. These inquiries of the present, past, and future moments, which are grounded in place, show ambivalence in all its nuances. All the ambiguities of separation, the humanistic postured reinterpretation of ambivalence explore the thought processes of being caught between making it work and giving up on the union. Struggle coincides with the flutter of melding conclusions, which hold the blueprints of these possibilities for an anxiety-free existence intact. Holistically, the poetic viewpoint renders points of transpiration life before these moments further change. Are you interested in the field of publishing? Do you wish you could get marketable job skills while earning college credit? Do you like to have a little fun while you learn? Then an internship with Superstition Review is right for you. We are currently accepting applications for Interns in Summer Session A and Summer Session B, and Trainees for Fall Session C. All work is done completely online through Blackboard, Google Docs, Skype, and email. I welcome interns from all fields, but especially from creative writing, literature, web design, art, music, film, and business. Superstition Review has published 10 issues featuring over 500 contributors from around the country. Each spring and fall we take submissions from established and emerging writers and produce an issue full of dynamic Art, Fiction, Interviews, Nonfiction, and Poetry. Students will register for a 3 credit ENG 484 course in Summer 2013 (there are two sessions: A=May & June and B=July & August). Students will gain experience with the processes and practices of a national literary publication. While we don’t produce an issue in the summer, we do maintain an active presence on our Blog, Facebook, Goodreads, Google+, iTunes, LinkedIn, Pinterest, Tumblr, and Twitter accounts. 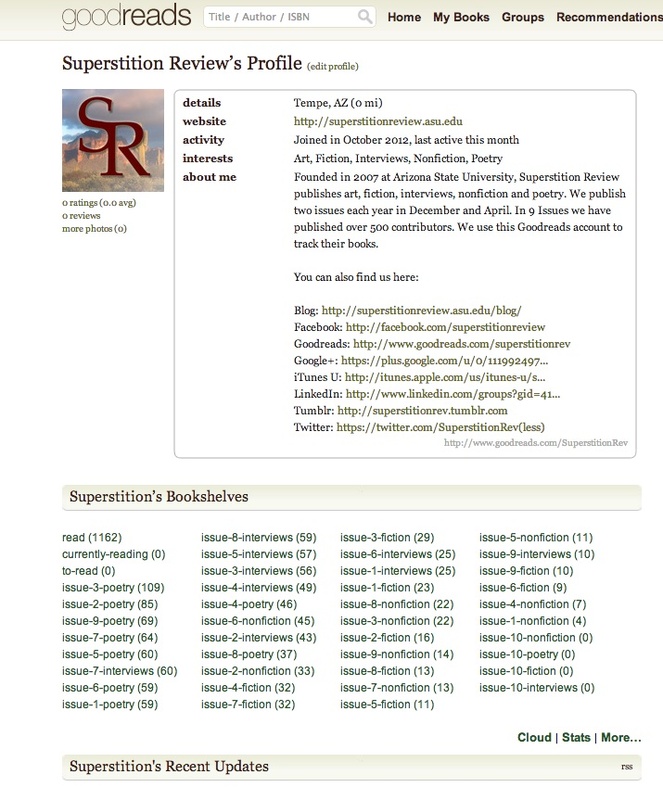 I am seeking trainees for the online literary magazine Superstition Review. Trainees will register for a 3 credit hour ENG 394 course in Fall 2013. The course will offer a study of the field of literary magazines; it will introduce students to the processes and practices of a national literary publication, and it will include review and reading of contemporary art and literature. Students will be encouraged to create their own literary brand that will help make them more marketable for publishing jobs. Upon successful completion of ENG 394, trainees will enroll in ENG 484 in Spring 2014 and become active interns with the magazine. Applications are open January 31 and will be accepted until positions are filled. Writing is a lot of work. Even when they’re not actively writing, writers are often thinking – even obsessing — about what they’re writing. One of the best ways to give your brain a break without the guilt of straying too far from work is to think about what other people have been writing. The site www.goodreads.com is the perfect way to relax between chapters. It’s like a Facebook for bookworms, where you can rate and discuss the books you’ve read with your friends and see what they think of the books they’ve been reading. You can rate books anywhere from one to five stars, and then you can write your own New York Times-style review to accompany your rating. But don’t forget to include a spoiler alert if you’re going to write about how it ends. Goodreads also has digital book clubs you can join and offers recommendations based on the books you’ve read and rated highly. They also sometimes put on special events, such as live video chats with authors. In August they interviewed Jennifer Egan, author of the Pulitzer Prize winning novel A Visit from the Goon Squad, and the moderator pulled many of his questions from the Goodreads users participating in the live chat forum. It was a great way for readers to get insight on Egan’s writing process. They also have contest for free advance copy giveaways so a select few readers can review new releases for the Goodreads community. It’s an excellent website for bibliophiles of all kinds.